(Nanowerk News) Fancy Erector Set? Nope. The elaborate fractal structure shown at right (with a close-up below) is many, many times smaller than that and is certainly not child's play. 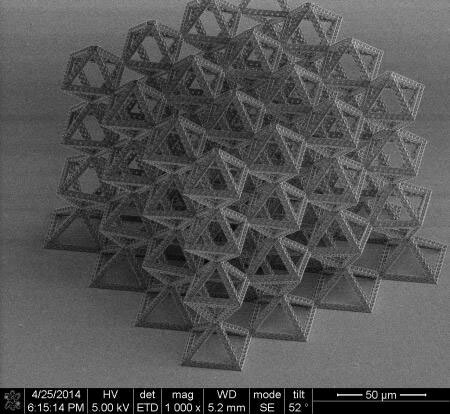 It is the latest example of what Julia Greer, professor of materials science and mechanics, calls a fractal nanotruss—nano because the structures are made up of members that are as thin as five nanometers (five billionths of a meter); truss because they are carefully architected structures that might one day be used in structural engineering materials. Greer's group has developed a three-step process for building such complex structures very precisely ("Made-to-order materials: Engineers focus on the nanoscale to create strong, lightweight materials"). They first use a direct laser writing method called two-photon lithography to "write" a three-dimensional pattern in a polymer, allowing a laser beam to crosslink and harden the polymer wherever it is focused. At the end of the patterning step, the parts of the polymer that were exposed to the laser remain intact while the rest is dissolved away, revealing a three-dimensional scaffold. Next, the scientists coat the polymer scaffold with a continuous, very thin layer of a material—it can be a ceramic, metal, metallic glass, semiconductor, "just about anything," Greer says. In this case, they used alumina, or aluminum oxide, which is a brittle ceramic, to coat the scaffold. In the final step they etch out the polymer from within the structure, leaving a hollow architecture. 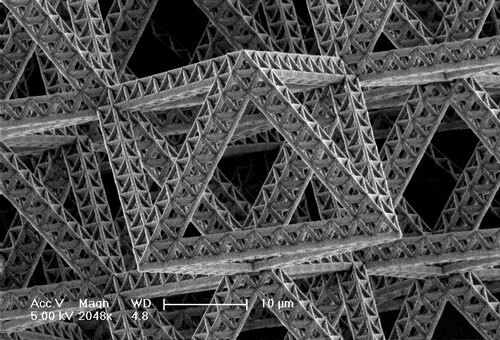 Taking advantage of some of the size effects that many materials display at the nanoscale, these nanotrusses can have unusual, desirable qualities. For example, intrinsically brittle materials, like ceramics, including the alumina shown, can be made deformable so that they can be crushed and still rebound to their original state without global failure. "Having full control over the architecture gives us the ability to tune material properties to what was previously unattainable with conventional monolithic materials or with foams," says Greer. "For example, we can decouple strength from density and make materials that are both strong (and tough) as well as extremely lightweight. These structures can contain nearly 99 percent air yet can also be as strong as steel. Designing them into fractals allows us to incorporate hierarchical design into material architecture, which promises to have further beneficial properties." The members of Greer's group who helped develop the new fabrication process and created these nanotrusses are graduate students Lucas Meza and Lauren Montemayor and Nigel Clarke, an undergraduate intern from the University of Waterloo.